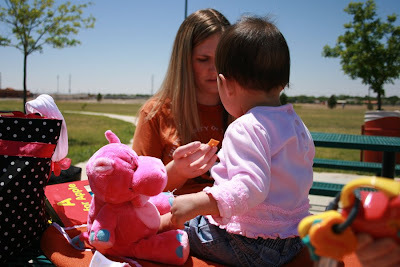 Milo and I went to the park yesterday to play with some friends from our church small group. 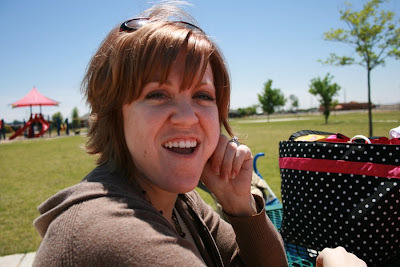 It was such a beautiful day and we had a great time hanging out with Tiffani, Amanda and Mia. It was kind of cool out so putting sun screen on Milo completely slipped my mind until we had been out there about a hour. I did put it on but by then it was too late, Milo received a bad burn on his arm. And for some reason I didn't even think to put any on myself so I am a major lobster right now. I called the doc yesterday to see if there was anything special I needed to do and she said just to put Aloe Vera on it, keep him Hydrated and keep him out of the sun for a couple of days. As long as it wasn't blistered then it probably wasn't that bad and it would be okay. Well this evening I looked down at him arm and there were a few big blisters and lots of little ones. A couple of the big blisters had already popped so I called again and the doc said it was a 2nd or 3rd degree burn and to put Neosporin on it and wrap in in gauze and bring him in to the office tomorrow. I feel soooooo AWFUL! I am heart broken that I forgot to put sunscreen on my baby and he got such a bad burn because of a foolish mistake I made. I mean, what kind of mother forgets to put sunscreen on her 7 month old!?! You better believe I'll never forget that again! 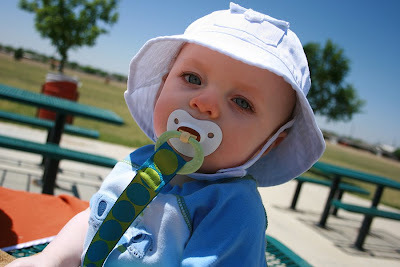 Here is Milo at the park in his sun hat. I was so glad that I kept that sun hat on him that whole time or he would have had the burn all over his head too.